When it comes to French pizza, this restaurant located along La Fayette area name Pizza Tivoli is one good food spot after your shopping therapy. Not only serving the best pizza in town, they also serve risotto and wide selections of pastas too. Even seafoods, french breads and antipasti selections are also available on their menu. Nothing so special about this place but they do provide authentic french cuisines and excellent food dishes worth dining for. 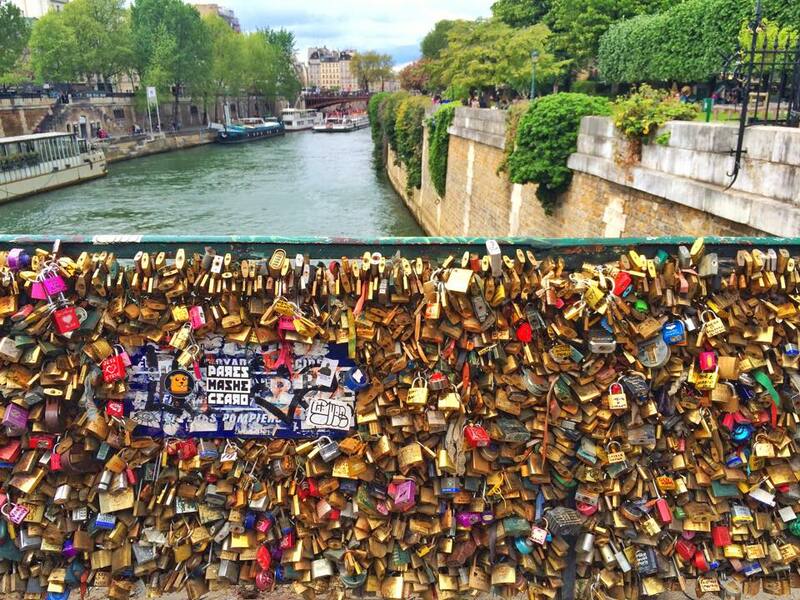 Welcome to Love Lock Bridge Paris! Commonly known as Pont des Arts or Passerelle des Arts, this iconic bridge in Paris located along Seine River. 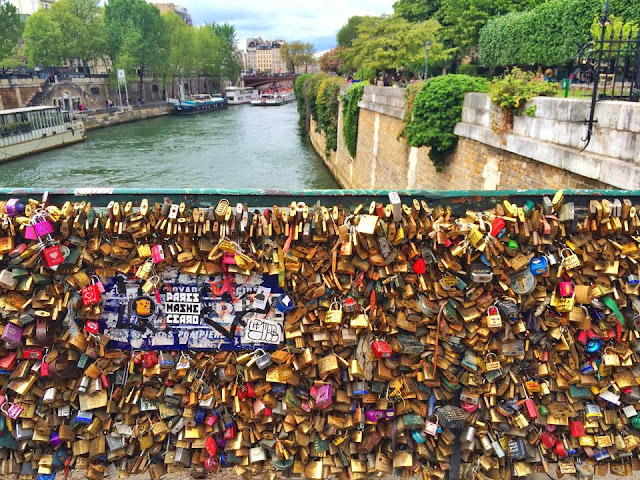 This tourist spot is obviously popular for dating couples in Paris attaching padlocks (love locks) with their names engraved or written on it. I was lucky enough to have placed my lock on it (even if I'm single though) so just need to be creative enough and replaced it with Mr. Right for now. Haha! But recent news showed that Paris officials removed it due to possible damage to the bridge structure due to locks weight, in fact just this year 2015 almost one million locks were placed weighing almost 45 tons. 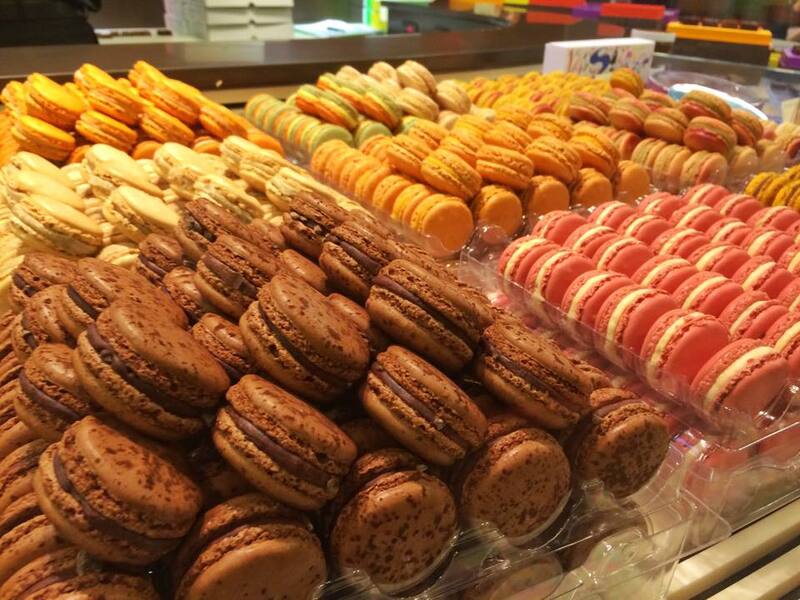 A trip to Paris wouldn't be complete without a taste of French macaroons. There are so many varities and brands to choose from but Pierre Herme Paris still stood out as one of flag bearer macaroon brand in Paris. You'll find awesome flavours to choose from whether you like to have the basic traditional flavours or you can even try the newest experimental flavours if you have an adventurous tounge. They also have French chocolates as an alternative option for their infamous macaroons. We found this branch in La Fayette located in the shopping area of Paris. Lucky enough we disn't have to fall in line for so long. We brought it back to Eiffel Tower area were we had our first taste of it. It was heaven from Earth, the chewy, creamy, sweet and sugar rush in your mouth bursting in super flavours was really worth every calories you have to digest. Eiffel Tower in Paris having various shots taken in different angles and perspectives. If there's one travel bucket list that we consider in life, I'm pretty sure Eiffel tower will always be on top list. Some may have seen famous Statue of Liberty or the Inca ruins of Machu Picchu but nothing else will beat the romantic & self- fulfilling touch of this world's renowed architectural wonder. Eiffel Tower in Paris is no doubt the most visited tourist atteaction in France. It symbolizes the French architectural mystery and rich historical progress. By simply sitting with it's view, you can spend hours just chatting with your travel mate while munching on delectable macaroons or having a glass of sparkling wine til sundown. Here's some postcards from Eiffel Tower with various angles and photography techniques using Canon DSLR, iPhone 5S edited via Snapseed and Go Pro Hero 4 Black. Hope you like the photos! Have you ever been dreaming of waking up in Paris and spending the first few hours of your morning in a world class breakfast buffet restaurant with over flowing wine and countless croissants? Well we're so lucky to experience out first Parisian breakfast in Petit Dejeuner Buffet where we stayed in Paris at Le Meridien Etoile. The breakfast buffet will start from 6:30AM to 10:00AM everyday. The price will start from 29 Euros which for me is a decent price considering our food experiences in Paris where our average bill for two will usually cost us around 50 Euros. I just love the plain, buttered & chocolate filled croissants. Any croissant in Paris can simply beat the best version here in Singapore. I also love their cheeses and cold cuts too! They also have bacons, pancakes, waffles, omelettes and even English breakfast cuisines. What's good about this restaurant is their spacious area with white interiors, enough tables & chairs plus good number of service staff to assist you! 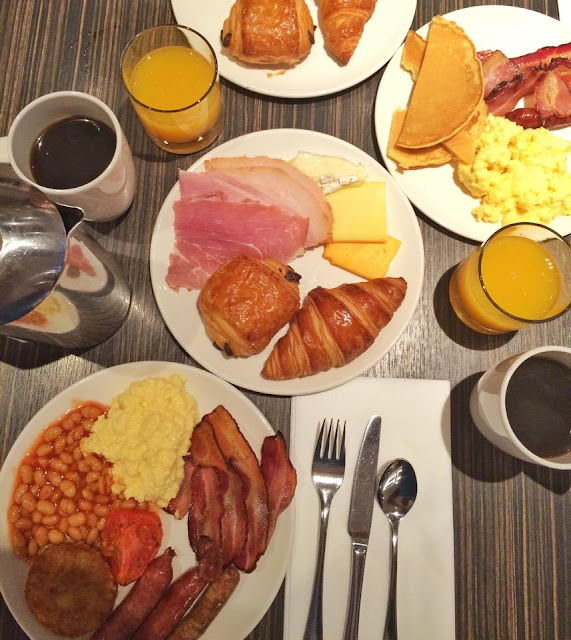 If you're in Paris and would like to get that full losing breakfast need, head down to Petit Dejeuner Buffet located at Le Meridien Etoile Paris. Have a blessed week to everyone! 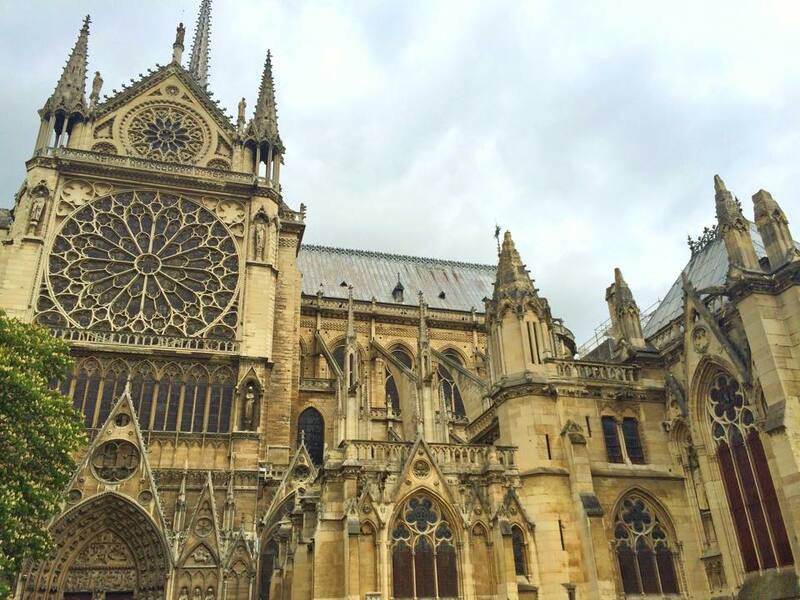 Can anyone guess this historical Cathedral in Paris France? Welcome to Notre-Dame! This church is one of the most beautiful cathedral I have ever seen in my life. Notre- Dame de Paris (Our Lady of Paris) is one of the most visited tourist spot, a historic Catholic Cathedral known for its French Gothic architecture. It is also considered the largest and most well-known church building in the world. How's your week so far? Hope you're still inspired on travelling the world and aiming to visit that dream country you have always been planning for. 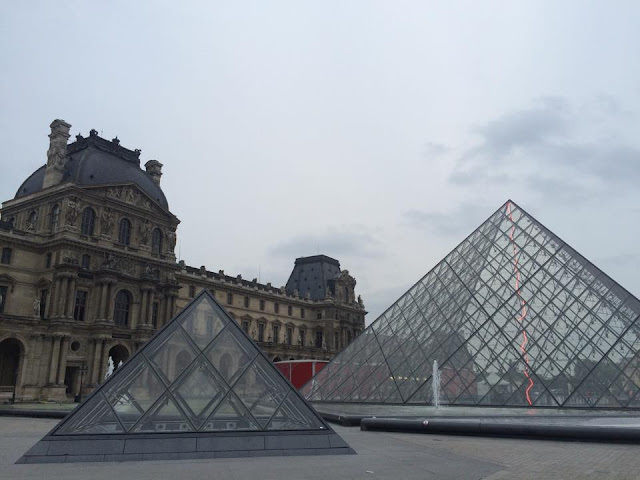 Let me share you again one tourist spot not to miss in Paris which is the Louvre Museum. The Louvre Pyramid (Pyramide du Louvre) is a large glass and metal pyramid surrounded by three smaller pyramids, in the main courtyard of the Louvre Palace in Paris. The large pyramid serves as the main entrance to the Louvre Museum, that has become a landmark of the city of Paris. We were not able to go inside the museum due to time constraints but just strolling around the courtyard area was good enough experience for me. You'll be amazed at the architectural designs and it's the perfect spot to have that picturesque scene of Paris for cover photo of your Facebook or profile photo in your Instagram (LOL!) I just love how every corner of Paris always offer some magnificent structural wonders and it's indeed a must-visit country in Europe. Louvre Museum is located in the heart of Paris near River Seine. Watch out for more travel spot to see in Paris so keep on following my blog for more travel posts! Happy Sunday folks! If you go to Paris, what outfit will you wear? 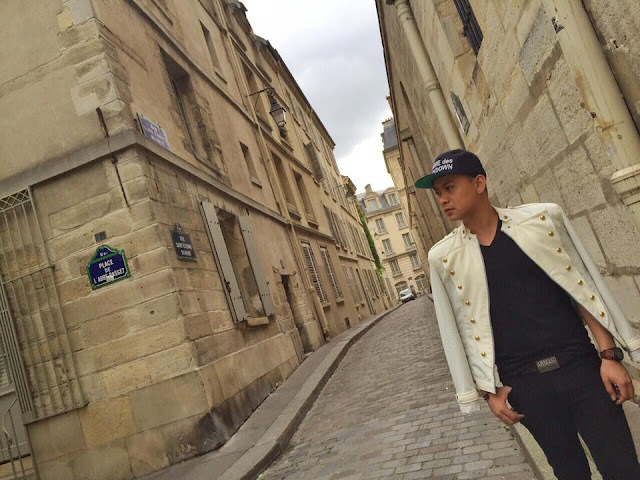 Well let me share you my Day 2 OOTD in Paris. Black truly will never go out of style, hence it was the theme of my look here. But wearing all black sometimes might seem dull and boring so why not break the monotony of it by throwing your look with a stylish white jacket in gold embellished button, now that's what you call CLASSIC style! I'm wearing a Lord Maturan's tailored white bomber jacket with embellished gold button details, hugs on the right places and chic like that. All black shirt (Armani Exchange) and leather black belt with silver buckle from A/X as well coordinated well on my look and paired it with skinny distressed black jeans from Pull & Bear with my woven-style black sneakers from P&B too. To make it the Parisian way, I'm using the ever reliable leather Pandora bag from Givenchy. Hope you're having the best time of your life and always stay fashionable kids, for life is just short to wear boring clothes. Have a great week ahead! Buffalo Grill was the first official restaurant that we have tried in Paris. 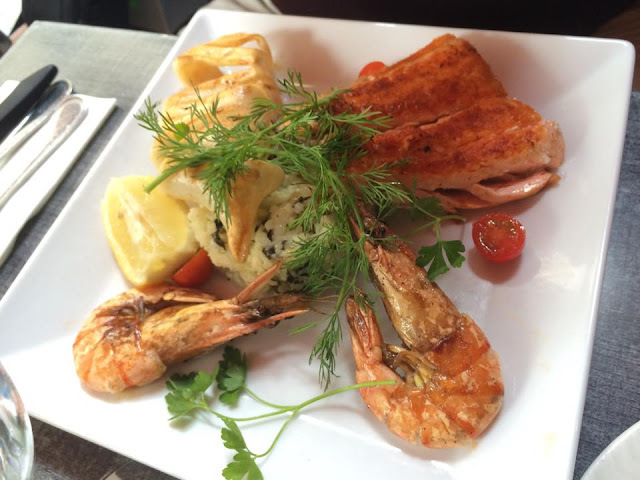 With all our food expectations on wines, cheese, pasta & steaks while in Europe the French food cuisine is definitely my best food experience so far. Good thing we had our first dinner in this humble food haven located along the corner just in front of the infamous Moulin Rouge- one of the most iconic place in Paris. Buffalo Grill is simply not all about grilled food menu items, in fact they offer almost anything in French cuisine from main course down to thier dessert. What makes it even more memorable was their superb interior design concept and where French red wines were even cheaper that bottled water. 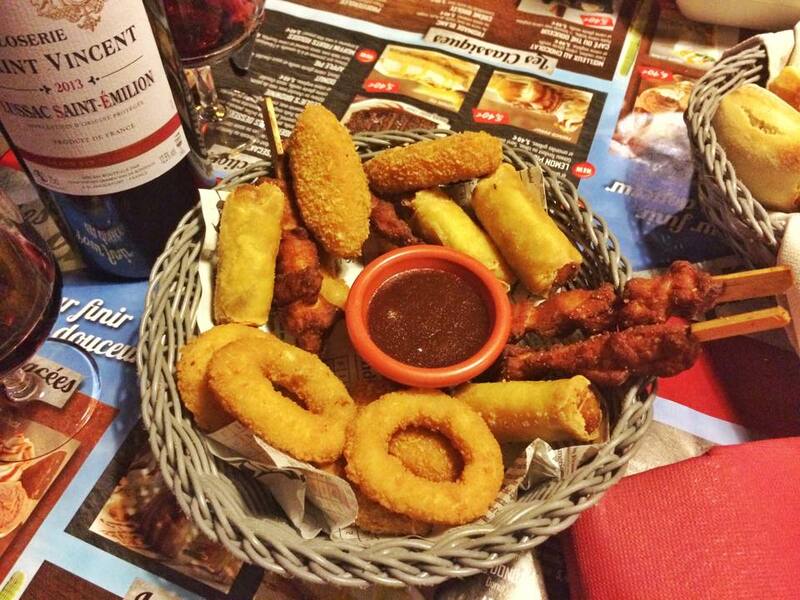 It took us quite long choosing the best dinner meal to try that's why we ended up choosing the perfect steak and wine conbo. I just love how French indulge on all these irresistable pastas and pastries everywhere you go. 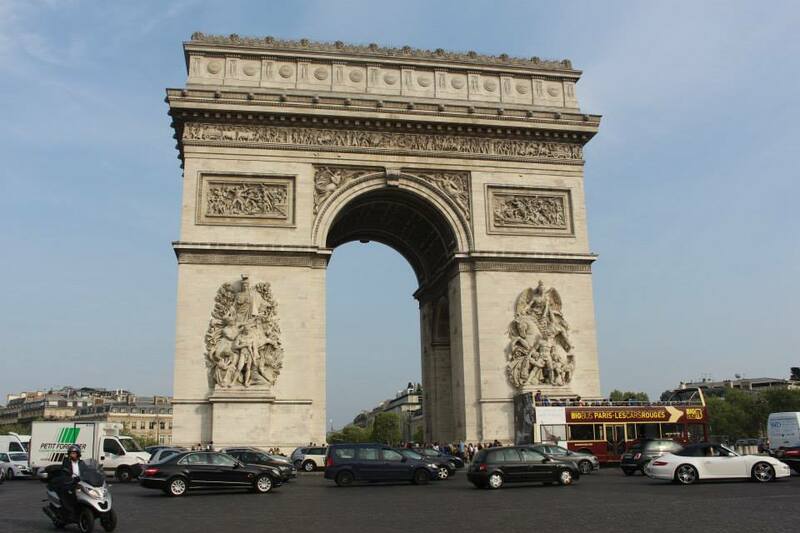 With it's neoclassical architecture, the Arc de Triomphe de l'Etoile is one of the most popular landmark in Paris. This monument started its construction in August 15,1806 with a height of 50 metres. It stands in the centre of the Place Charles de Gaulle, at the western end of the Champs-Elysees. Always busy with cars going around it, this famous monument is simply amazing and worth a visit. I haven't been up to the top, but you can go under it via stairs and can go on top to reach the view deck where you can experience Parisian sunset with the sunlight shining through before darkness sets in as what I've always seen on Instagram photos of some celebrities. You'll also be surprised on all the cars and people navigate and stroll along this area but not having any accidents at all. You can also avoid crowds by visiting at nght here. 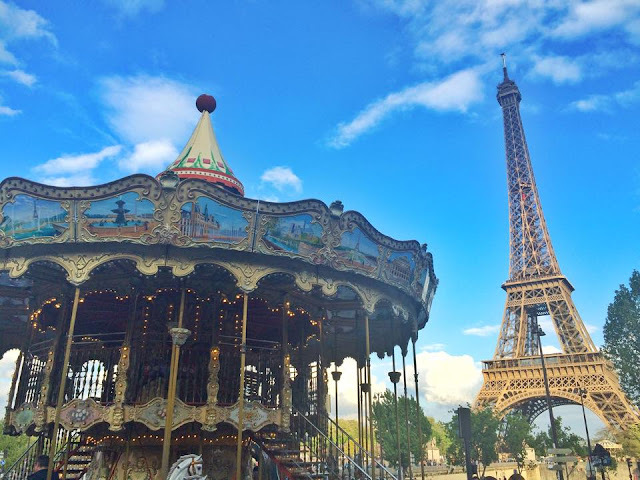 I really love it here so include this in your must see spot when you visit Paris! During my recent trip in Paris, we stayed in this hotel that helped us unlock a unique experience in Paris & made our stay more inspiring located only few blocks away from the famous Arc de Triomphe. Welcome to Le Meridiean Etoile Paris! From the interior design alone, you'll notice it's modern look and Parisian style combined perfectly for your best stay in Paris. We booked a King bed room with classic non-smoking room with a size of 21 sq.m by 24 sq.m and comes with pay per view movies, high-speed internet, new Le Meridien bed and Cable TV as well. The room rate (average estimate room total per Night*) was 140.00 EUR. The actual total will be calculated by the hotel in its local currency, based on the local taxes and currency exchange rate. Check in time will be 3:00 PM* and check out by 12:00PM*. 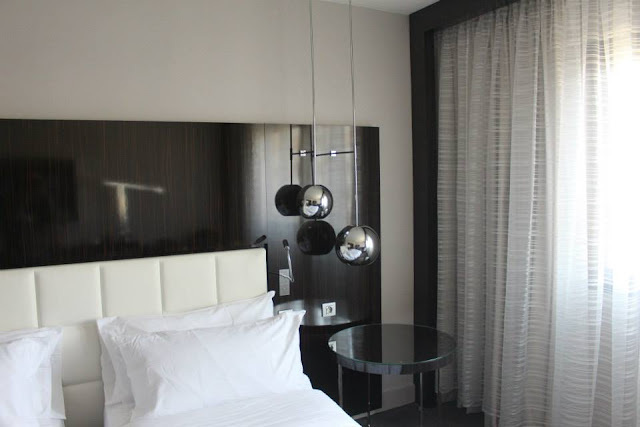 Le Meridian Etoile offers the best in room service, breakfast buffet, French restaurant and modernistic reception area that is strategically situated near malls, landmarks, train stations and famous restaurants around Paris. If you're looking for the best stay for your Paris trip, you better book Le Meridian Etoile!